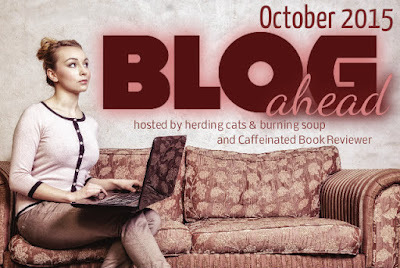 I’m signing up for the Blog Ahead Challenge in October. The goal is to create 31 posts for November and beyond – a blogging “cushion” to relieve the stress of the holiday season. The posts can be anything – reviews, discussions or essays, lists, recipes… whatever fits your blog style. The only caveat is that the posts have to be complete and ready to go. I need this, big time. I got way behind while I was away in August (and a bum wrist didn’t help.) Right now, I’m struggling just to stay current, let alone schedule ahead. So this challenge is definitely something I can use. I have post ideas and about 15 books I’ve read and still need to review. (Not ARCs, mostly – just books from the library or my own collection.) I just need to get around to doing them! My goal is 31 posts, but frankly, I’ll feel good even if I only manage half that many. Either way, I’ll be in better shape than I am now. Want to join in? Click on the link above or the button below, or go to either of the hosts’ blogs and look for the sign-up sheet. There you’ll find the rules (miminal), a place to link your sign-up post, and ways to meet and share ideas and encouragement on Facebook and Twitter. I’m so glad to see you’re joining in, Lark! This summer zapped my reserves too so definitely needing it. And so with ya. Even a couple extra ahead would be fantastic 😀 Good luck next month! Thanks, Anna, and good luck to you, too! Yay, you’re joining us! I need this too, especially if I get the job I’m interviewing for on Monday. That will significantly reduce my blogging time. We can do this, yes we can! This is such a good idea! I’m getting posts together now for Witch Week in October. 30 would be a lot though — I can’t quite imagine doing that many! Lory @ Emerald City Book Review recently posted…What would you like to read for Witch Week? I know. I’m nervous I can’t get that many done, but we’ll see. Maybe I’ll learn to work more efficiently! And anything I can get done is better than nothing! Ooh, this sounds like something I should participate in! I scheduled almost all of my posts for August and early September back in July because I knew I would be busy and it was wonderful – all I had to do was answer comments! 🙂 I’ll check out the original post. I am participating in this challenge as well :). My goal will be to write 10-20 posts for november and later. As October will be a busy month and I don’t think I can write more posts than that and I dont want to stress myself too much. I participated last year as well and I’ve been ahead with posts ever since then, it’s such a big help! Good luck with the challenge!